Ever noticed how great musicians or bands are able to write songs in their own unique style, yet each of their tracks is completely different from the others? How separate tracks on an album can work as individuals, yet still make up an overall narrative that ties together the whole work? How they can be so damn perfect, yet so damn unique all at the same time? Well if you wanted a custom bike shop equivalent, you need look no further than Miami’s legendary Moto Studio and their frontman, Maximiliano Medina. 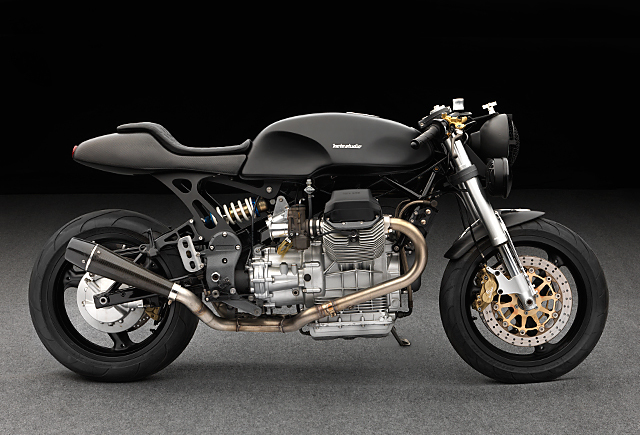 And here they are with yet another hit; this time it’s a Guzzi with looks that’ll be sure to give it some time in the limelight – especially with those headlights. 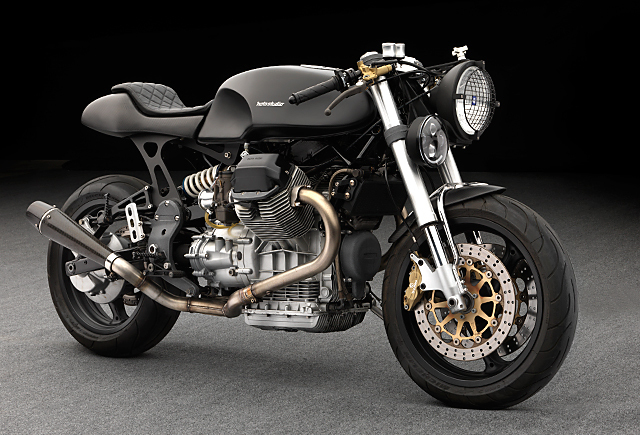 Maximiliano started with a ‘01 Moto Guzzi V11 Sport. 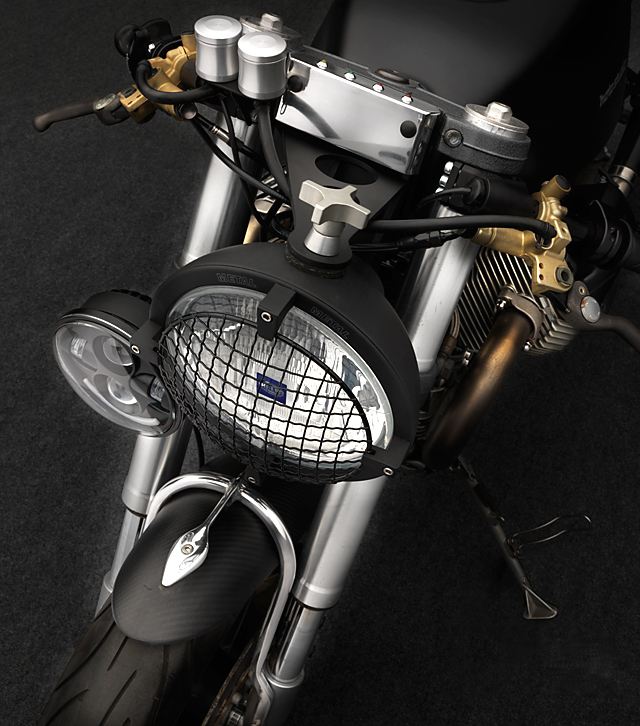 From the factory, the V11 featured a six speed gear box, Marzocchi USD forks and a claimed dry weight of 221 kg/486 lbs. So it’s probably fair to say that it was never svelte by any means. But as Max has learnt over the years, the re-design of these bikes is more an epic mission in weight reduction than anything else. And so him and his designer/CEO, Bruce McQuiston, got to dieting… with an angle grinder. The crew at Moto Studio started by removing everything unnecessary. This included the fuel injection, fuel pump, ECU and stock wiring, which amounted to over 25 lbs/11 kg of lost weight by itself. Then, in order to run the Delorto 40mm pumper carbs, a digital ignition module from Electronik Sachse was the deemed the best solution. 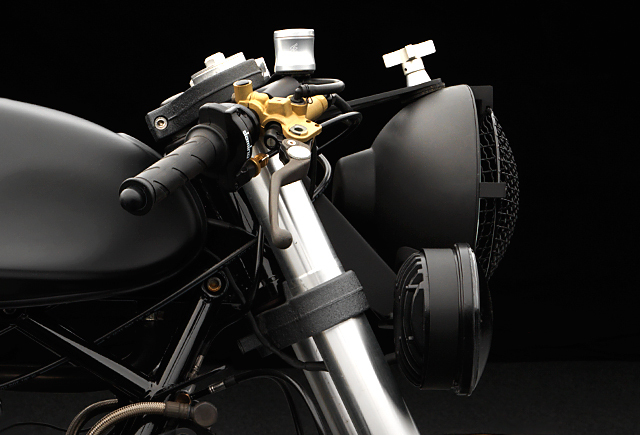 Utilising both the switch gear and the ‘M Unit’ from Motogaget, along with an in-house and bespoke wiring harness, the new electronics are not only minimal, but are also more functional and at a mere 15% of the original weight. Impressive stuff. 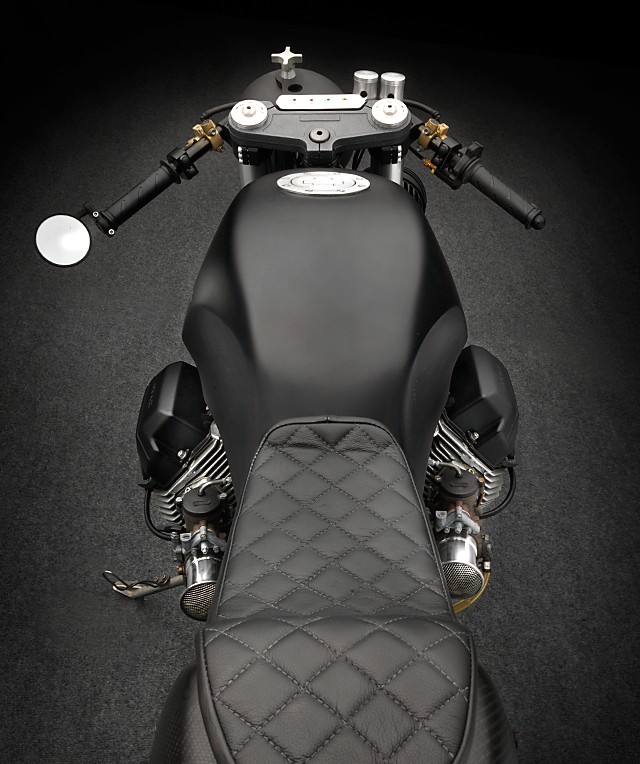 A carbon fiber seat cowl, fender and reverse cone mufflers, which were all designed and manufactured by Moto Studio themselves, were mated to a steel gas tank from a carburetted Moto Guzzi 1100 Sport. Completing the blacker-than-black, post-apocalyptic survival vibe is a Hella 4000 rally car head light supporting a LED main headlight. It’s quite the cool look, yes? 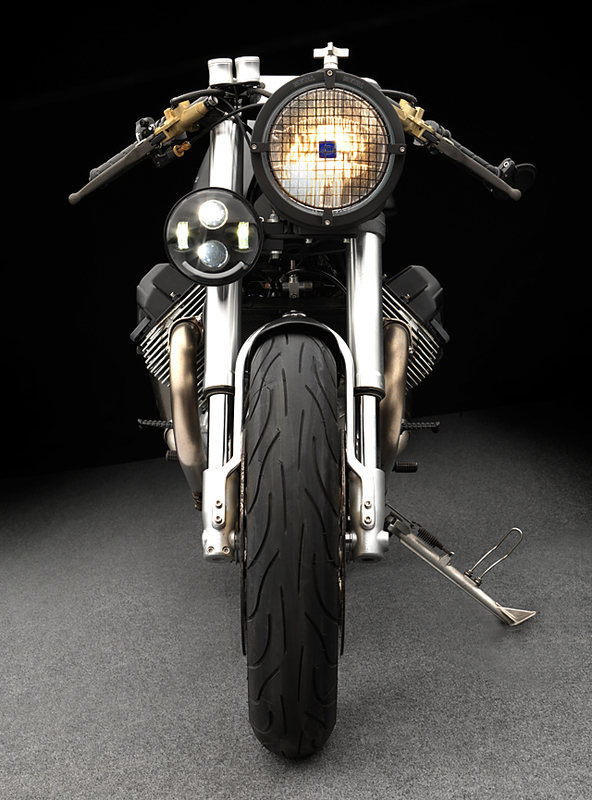 Handmade details abound, including the sub frame, front fender mount, shock canister mount, and headlight mounts to name just a few. And with a final weight a shade under 200 kg/442 lbs with fluids, Max smiles as he tells us that the ride is ‘sublime to say the least’. Those who know anything about the ol’ Muzzis will undoubtedly tell you that the V11 was a big step forward for the company. And if that is indeed the case, the we feel that it’s only fair to say that this rather amazing build is a giant leap beyond that. Rock on, Max. Rock on.